"I'm sorry about the ice cream!" Either this game features a flashback cutscene detailing what the heck Donald was referring to, or I'm cancelling my pre-order. It's a mistranslation. Or perhaps more accurately, a rewrite. In the Japanese version of the game, Donald saysã€Œã‚°ãƒ¼ãƒ•ã‚£ãƒ¼ã”é£¯ã ãžï¼ã€or, "Goofy, there's food!" What the heck is THAT supposed to mean?! Is Donald trying to bring Goofy back to life with the promise of food?...because if so, that'd be pretty effective. Donald trying to revive Goofy with the promise of food is amusing. He always did seem to have the biggest appetite out of the three of them. Maybe that's why no one dies in this series. They're too hungry to die! That seems to be the intent. The line SENA wrote seems to be referring to the scene where Donald eats the sea-salt ice cream, while Goofy protests. But it's not as though Goofy wanted to eat it himself, he was cautioning Donald that it might not be safe. Not sure what the logic was with whoever wrote that line. But...that scene comes AFTER Goofy's "death"!! Well now it really doesn't make any sense. Donald can see into the future and is apologizing for what is to come. How baffling to change bribing Goofy with food to the apology. I'm always curious about the reasons for changes like this. Donald saw into the future and is apologizing ahead of time, obviously. I wonder if the person who was translating didn't know the order of the two scenes. "A-hyuck, I'm sorry about Daisy!" Post-credit scene shows Goofy ****s Donald and he predicted the future. Oh...I always thought this too lol. I guess the real answer is KH2's dialogue wasn't really great as it is, and then the English version seemed to make it even worse lol. With numerous issues like this and Goofy wrongly gendering which Royal banished Pete. KHI going stir crazy with the last few days. Actually goofy and Donald weren't at Disney Castle/town when it occurred. They could have found out about the banishment but thought Mickey did it though. Goofy did WHAT to Donald?! Worse? or Better? Lol I'm honestly surprised that it's blocked, I figured it was a normal terminology, never considered it a bad word. It surprised me too. Never considered it a bad word. Rude maybe, but not a top tier swear. Great movie lol I was quoting Invader Zim also. "I put the fires out!" "You made them worse." 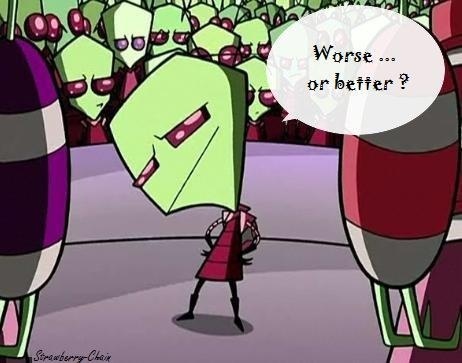 "Worse...or better?" I guess thats possible, but I doubt Minnie or Daisy wouldn't have filled them all in on something so important. They are literally the heads of protection for the Kingdom, right? Its something the series doesn't talk about much, but that's still true lol.